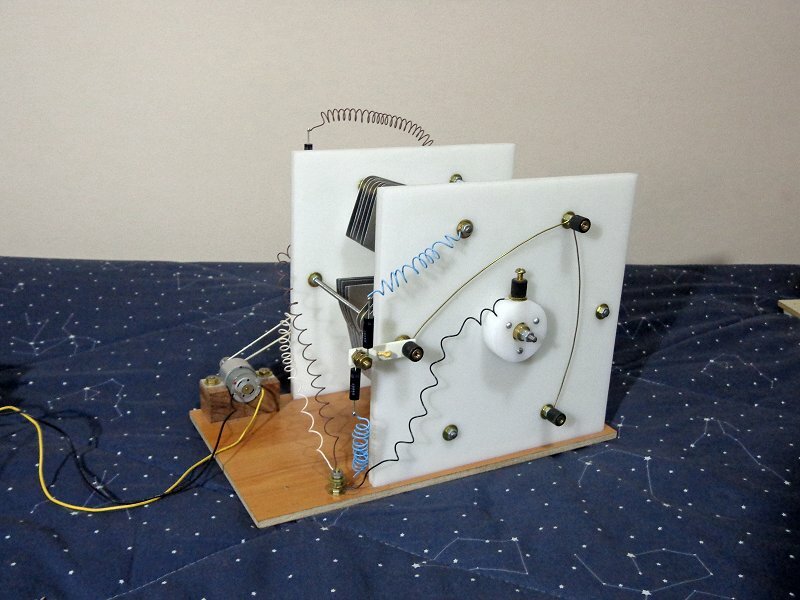 In May 2015, continuing studies about energy harvesting using electronic electrostatic generators, I built an electronic version of Wilson's machine, or a "double electrophorus machine". The machine is composed of two rotating complementary variable capacitors, connected to terminals where diodes, capacitors, etc. can be connected. An electric motor turns the rotating plates, making three complete capacitance variations per turn. The structure was built using two vertical HDPE plates, interconnected by threaded rods that support the fixed plates of the variable capacitors, with the rotating plates mounted on ball bearings at the center, having two sections insulated one from the other. The rotating plates have 16.5 cm of diameter, with five sections for each capacitor. The fixed plates have six sections, with 19 cm of diameter at the supporting rods. The base was cut from an MDF floor board. 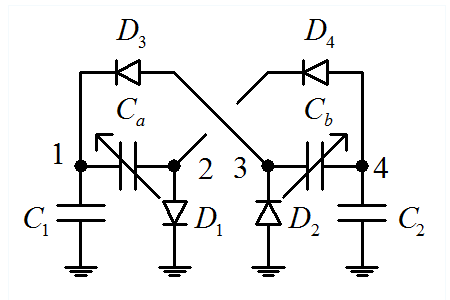 For the equivalent of Wilson's machine, four high-voltage, low-leakage, diodes (the type used in microwave ovens works well) are necessary, mounted as in this schematic. 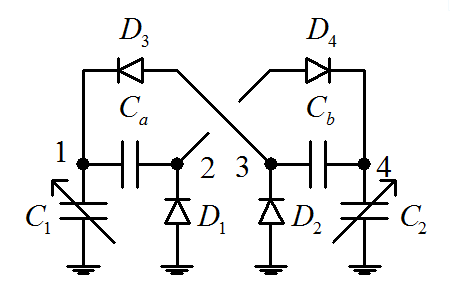 The two load capacitors can be provided by the distributed capacitances of the device, or can be added through the connection terminals, as shown. This machine requires a capacitance variation greater than 2:1 for operation, and can produce a voltage multiplication factor of up to 2.618 per cycle (1/3 of a turn), ideally, for large capacitance variation. The device varies the capacitances between 60 pF and 360 pF. It self-excites easily from external electrical interferences, and sparks at the variable capacitors when the terminal voltages reach about 3 kV. 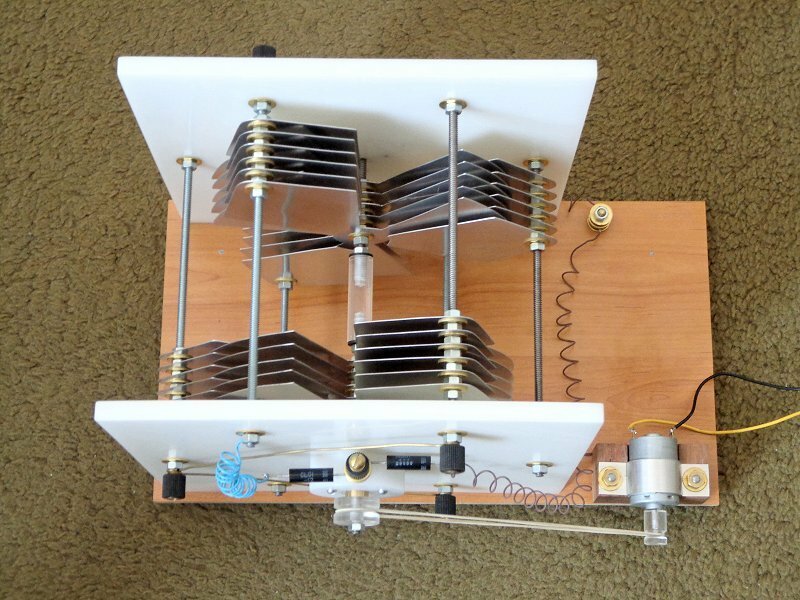 The two outputs over the load capacitances are symmetrical, positive and negative. The variable capacitors can also be rotated synchronously by readjusting the rotor, rotating it by 60 degrees, and then the machine operates as in the device shown in , with a smaller voltage multiplication factor, limited at 2. A curious variation of this machine, observed in December 2015, is obtained by connecting it in this alternative way. The fixed capacitors (330 pF, 3 kV) and variable capacitors are interchanged, with the variable capacitors grounded (at the rotor in the photo). Two of the diodes are inverted. 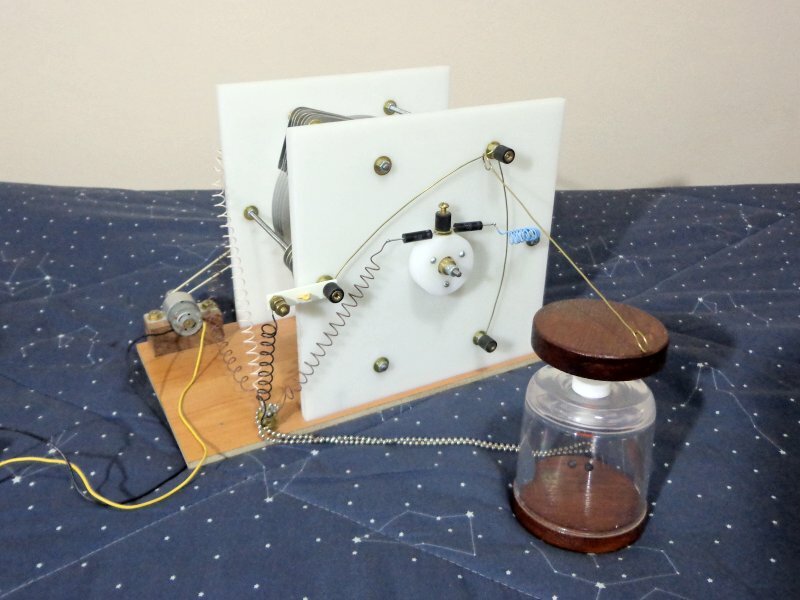 The machine works in an unusual way for an electrostatic generator, producing two outputs with identical polarities, over the variable capacitors. For the diodes as shows, the outputs are positive. With the diodes inverted, negative. Video of the unipolar machine in operation. Patent US2567373 L. J. Giacoletto and I. Wolff, "Electrostatic generator," 11 September 1951.